In 2010, Architect Krista Boehner and her husband, Allan became owners of an “original” cape house in Martins River, N.S. The house was built in 1887 by Allan’s great-grandparents and descendants of German immigrants, Francis and Keziah Boehner. In 2010, the house was in near original condition and habitable. At the time, Allan and Krista felt it was necessary to renovate the house to reflect a modern lifestyle and for safety reasons. 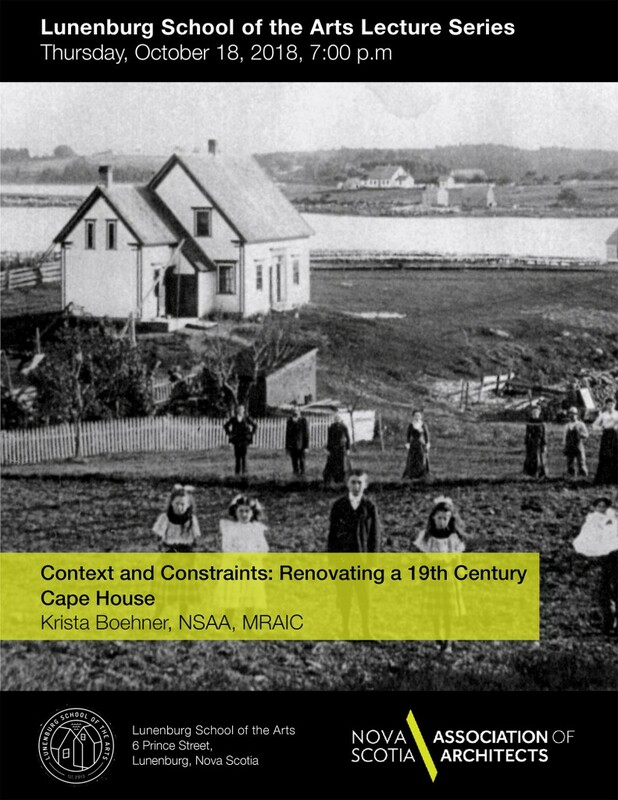 “Contexts and Constraints: Renovating a 19th Century Cape House”, recounts the renovation process of a cape house and personal life experiences of architect Krista Boehner. The talk touches upon some of Krista’s previous experience as an architect and how that experience became relevant to the renovation of her own house. The condition of the original house and new work completed will be illustrated through drawings and photographs. The context of the house and constraints the Boehners faced during the renovation will be described, as well as historical information uncovered. Krista will share insight into why the renovation of the Boehner house was anything but a perfect or complete process. Krista Boehner was born in Halifax in 1971. During childhood, she developed an affinity for nature at her grandparents’ lake side chalet in Waverley, N.S. Krista’s early experiences with her grandparents were the basis for her sensitive and economic approach to design. As a child, she began drawing in her neighborhood with her brother, who was inspired by Robert Bateman. These early drawings became part of Krista’s entrance portfolio to architecture school. In 1999, she completed a work term in Yellowknife, N.W.T. In 2001, Krista graduated with a Master of Architecture from Dalhousie University in Halifax, N.S. During her internship in architecture, Krista’s most substantial experience was in renovations to healthcare facilities. Through this experience, she became interested in the constraints existing conditions place on design and renovation working drawings. In 2008, Krista became a member of the Nova Scotia Association of Architects. In 2009, she moved to Martins River and began her own architecture practice, KMW Architecture. The practice’s main interest is working on residential buildings with specific interest in renovation, heritage and aging in place. Krista is married and has a daughter.